Be glad, be very glad that your eyes aren't as powerful as electron microscopes. If they were, you'd see the world around you crawling with all kinds of horrible bugs. How filthy and nasty life would seem! Just as well, then, that we have autoclaves: machines for sterilizing such things as surgical instruments and hospital equipment. They're a bit like giant pressure cookers that use the power of steam to kill off germs that would survive a simple washing with boiling water and detergents. Let's take a closer look at what they are and how they work! Photo: Looking inside the open door of a large autoclave. 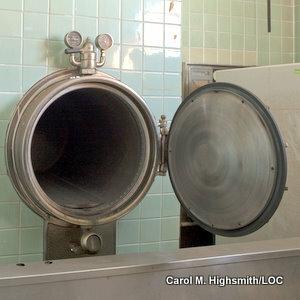 This one was used to sterilize medical equipment at Bryce Hospital in Tuscaloosa, Alabama. Photo by Carol M. Highsmith courtesy of The George F. Landegger Collection of Alabama Photographs in Carol M. Highsmith's America, Library of Congress, Prints and Photographs Division. What does an autoclave do? 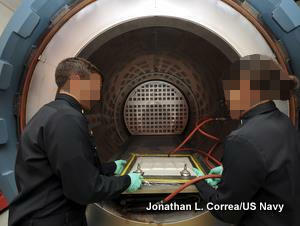 Photo: Medics test a steam-sterilizing autoclave before use. This one is a microprocessor-controlled Hanshin HS-4085G, which can sterilize loads of up to 85.6l (22.6 gal) at temperatures up to 135°C (275°F). Photo by Roadell Hickman courtesy of US Navy. Although autoclaves have many important scientific and industrial uses, which we'll cover later, the main focus of this article is going to be on how these handy machines are used in sterilization. You've probably heard of pressure cookers? They were all the rage until microwave ovens became popular in the 1980s. They're like over-sized saucepans with lids that seal on tightly and, when you fill them with water, they produce lots of high-pressure steam that cooks your food more quickly (if you want to know more, please see the box at the bottom of this page). Autoclaves work in a similar way, but they're typically used in a more extreme form of cooking: to blast the bugs and germs on things with steam long enough to sterilize them. The extra pressure in an autoclave means that water boils at a temperature higher than its normal boiling point—roughly 20°C hotter—so it holds and carries more heat and kills microbes more effectively. A lengthy blast of high-pressure steam is much more effective at penetrating and sterilizing things than a quick wipe in ordinary hot water! Pressure is the way a force acts over a surface. If you pump air into a bicycle tire, the energetic molecules of gas rush about inside, colliding with the tire walls and pressing outward. The tire stays springy and inflated because the air molecules push its inner walls with as much (or greater) force than the air molecules outside are pushing the outer walls. If you heat up a tire, you give the air molecules more energy. They rush about faster, collide with the rubber walls of the tire more often and exert even more force. The tire feels more pumped up or, if you're unlucky, bursts! This simple equation tells you that if you apply a given force to half the area, you double the pressure. Apply the force to twice the area and you halve the pressure. Photo: Thumbtacks (drawing pins) use the science of pressure. The difference in area between the head you push and the sharp point that enters the wall effectively magnifies your pushing force. It's very helpful to know about pressure in everyday life. Suppose you want to put a poster up on your bedroom wall. 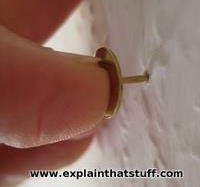 Assuming you don't have a hammer, you'll find it much easier to use thumbtacks (drawing pins) than nails. A thumbtack has a huge flat head connected to a very thin pin with a sharp tip. When you push on the flat head, you apply a certain amount of force to a fairly big area. The force is transmitted right through the pin to the tip, where it now acts on an area of metal that's maybe 100 times smaller. So the pressure on the tip is effectively 100 times greater—and that's why the pin enters your wall so easily. Snowshoes and tractor tires use exactly the same principle only in reverse. They spread weight (the force of gravity) over a bigger area to stop your body (or a machine) from sinking into soft ground. Suppose you have a saucepan full of potatoes that you want to cook. You fill the pan with water, put it on a hot stove, and wait for the water to boil. Now you probably think the water will boil "when it's hot enough"—and that's true, but only half true. The water will actually boil when most of the molecules it contains have enough energy to escape from the liquid and form water vapor (steam) above it. The hotter the water is, the more energetic the molecules are and the more easily they can escape. So temperature plays an important part in making things boil. But pressure is important too. The higher the pressure of the air above the water, the harder it is for the molecules to break free; the lower the pressure, the easier it is. If you've ever tried making a cup of tea on a mountain with a portable camping stove, you'll know the water boils at a lower temperature at high altitudes. That's because air pressure falls the higher up you go. At the top of Mount Everest, air pressure is about a third of what it would be at sea level, so water boils at roughly 70°C or 158°F (see why on this MadSci forum posting). Mountain-top tea tastes pretty disgusting because the water boils at too low a temperature: even though it's boiling, the water is too cold to "cook" the tea leaves properly. Read more about pressure, temperature, and how molecules behave when liquids boil. 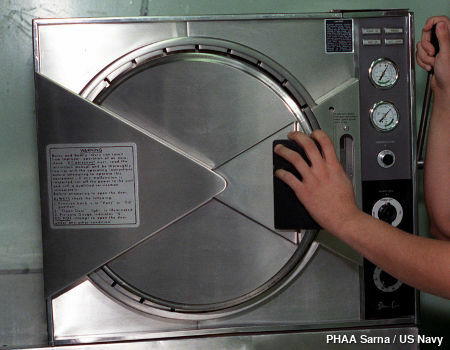 Photo: Closing the door on a typical laboratory autoclave. Note the large handle on the right being used to seal the door completely. Also note the dials on the right-hand side that indicate temperature and pressure. Photo by PHAA Sarna courtesy of US Navy. An autoclave is essentially just a large steel vessel through which steam or another gas is circulated to sterilize things, perform scientific experiments, or carry out industrial processes. Typically the chambers in autoclaves are cylindrical, because cylinders are better able to withstand extreme pressures than boxes, whose edges become points of weakness that can break. The high-pressure makes them self-sealing (the words "auto" and "clave" mean automatic locking), though for safety reasons most are also sealed manually from outside. Just like on a pressure cooker, a safety valve ensures that the steam pressure cannot build up to a dangerous level. How do you use an autoclave? 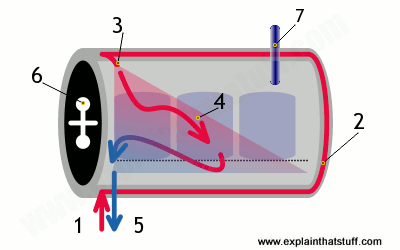 Artwork: How an autoclave works (simplified): (1) Steam flows in through a pipe at the bottom and around a closed jacket that surrounds the main chamber (2), before entering the chamber itself (3). The steam sterilizes whatever has been placed inside (in this case, three blue drums) (4) before exiting through an exhaust pipe at the bottom (5). A tight door lock and gasket seal (6) keeps the steam securely inside. A safety valve (7) similar to the ones on a pressure cooker will pop out if the pressure gets too high. Once the chamber is sealed, all the air is removed from it either by a simple vacuum pump (in a design called pre-vacuum) or by pumping in steam to force the air out of the way (an alternative design called gravity displacement). Next, steam is pumped through the chamber at a higher pressure than normal atmospheric pressure so it reaches a temperature of about 121–140°C (250–284°F). Once the required temperature is reached, a thermostat kicks in and starts a timer. The steam pumping continues for a minimum of about 3 minutes and a maximum of about 15–20 minutes (higher temperatures mean shorter times)—generally long enough to kill most microorganisms. 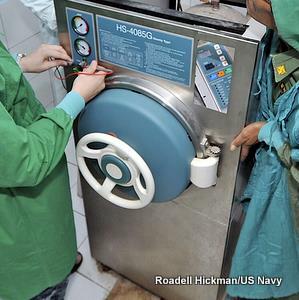 The exact sterilizing time depends on a variety of factors, including the likely contamination level of the items being autoclaved (dirty items known to be contaminated will take longer to sterilize because they contain more microbes) and how the autoclave is loaded up (if steam can circulate more freely, autoclaving will be quicker and more effective). Autoclaving is a bit like cooking, but as well as keeping an eye on the temperature and the time, the pressure matters too! Safety is all-important. Since you're using high-pressure, high-temperature steam, you have to be especially careful when you open an autoclave that there is no sudden release of pressure that could cause a dangerous steam explosion. Photo: Scientific autoclaving: US Navy engineers load an autoclave with a piece of aluminum to heat and bond a composite patch onto it. Photo by Jonathan L. Correa courtesy of US Navy. Artwork: A simple industrial autoclave from the early 20th century, designed for manufacturing various industrial chemicals using acids. It's essentially a reinforced, acid-resistant cooking vessel (blue) with a removable screw-on top (orange). You can add chemical ingredients through the smaller screw-on entry hole (green) and stir them using a gear-driven agitator (red). This is more like a modern pressure cooker than an autoclave. From US Patent 1,426,920: Autoclave by Oliver Sleeper, August 22, 1922, courtesy of US Patent and Trademark Office. Rubber can be vulcanized (heated, toughened, and hardened with sulfur) in an autoclave. Nylon (a plastic) can be made by "cooking" a concentrated salt solution in an autoclave to encourage what's called condensation polymerization. Polyethylene (polythene, another plastic) can be made by circulating air or organic peroxides through an autoclave to polymerize ethylene. Airplane materials made from composites are also typically cured in large industrial autoclaves. Some autoclaves combine elements of both sterilization and industrial manufacture. For example, natural cork (wooden) bottle stoppers have to be boiled and sterilized before they're suitable for use. Traditionally, that was done in large water tanks; now it's much more likely to be done on a large scale in computer-controlled, industrial autoclaves. Photo: Scientific autoclave: Inspecting a crystal grown in microgravity inside a cylindrical autoclave. 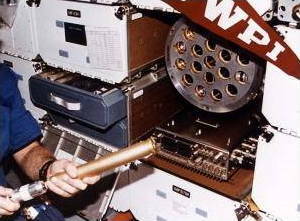 This scientific experiment was carried out onboard the Space Shuttle in October 1995. Photo by courtesy of NASA Marshall Space Flight Center (NASA-MSFC). Ancient Greeks use boiling water to sterilize medical tools. 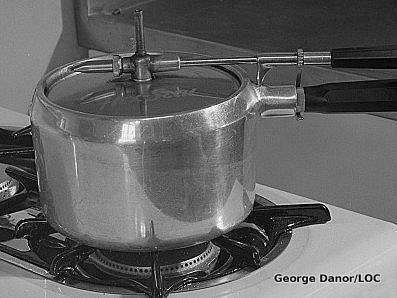 1679: French engineer Denis Papin (1647–1712) invents the steam pressure cooker—an important step in the development of steam engines. 1860s: French biologist Louis Pasteur (1822–1895) helps to confirm the germ theory of disease. He realizes that heating things to kill germs can prevent diseases and extend the life of foodstuffs (which leads him to the invention of pasteurization). 1880s: Pasteur's collaborator Charles Chamberland (1851–1908) invents the modern autoclave. Want to cook your dinner in a fraction of the time? You could use a microwave to zap it with energetic waves. But another popular solution is to seal it in a pressure cooker: a kind of saucepan that cooks things quicker by boiling them at a higher temperature than usual. Although considered old-fashioned by some, pressure cookers are still a convenient and economical way to prepare food. The basic concept—using pressure to cook an an elevated temperature—is the same as what happens in an autoclave. Photo: A pressure cooker in action. Notice the valve on the top through which steam escapes and the double handle arrangement used to lock the lid. Photo by George Danor, US Office of War Administration, courtesy of US Library of Congress. We've already seen that high pressure raises the boiling point of water. Suppose we could somehow arrange things so that the air above our saucepan was actually at a much higher pressure than usual. That would make the water boil at a significantly hotter temperature, which would make the potatoes cook more quickly. This is the basic idea behind pressure cookers. A pressure cooker is a big steel saucepan with a tight-fitting lid. The outer edge of the lid has a thick circle of rubber called a gasket that fits between the bottom of the lid and the top of the pan to make a really tight seal. When you fill the pan with water and place it on the stove, the water heats up and some of its molecules escape to form steam up above it. With a normal pan, the steam would just drift off into your kitchen and disappear. But with a pressure cooker, the gasket and lid stop the steam escaping so the pressure soon builds up. Although the water inside the pan boils, the higher pressure means it boils at a higher temperature than normal that cooks your food more quickly. A special valve on the top of the lid allows a small amount of steam to escape, keeping the pressure higher than normal but not so high that the cooker explodes. If the pressure inside the pan builds up too much, the valve pops right out, rapidly lowering the pressure to a safe level again. Disinfection, sterilization, and preservation by Seymour Stanton Block. Lippincott Williams & Wilkins, 2001. A comprehensive practical guide to medical, surgical, and public health applications. Laboratory Autoclaves, High Pressure and Hydrogenation Apparatus: Design & Construction by Harold Goodwin. Wexford College Press, 2006. A short introduction to developing autoclaves of all shapes and sizes. Solar Power: An Alternative Device to Sterilize Surgical Instruments in Rural Areas by Donald G. McNeil Jr. The New York Times. November 12, 2012. Solar-powered autoclaves could bring immense medical benefits to rural Africa. Instant steam could banish MRSA: BBC News, JUly 29, 2007. Superheated steam from a handheld "gun" could be an alternative to autoclaving. Microbe breaks temperature record by Helen Briggs. BBC News, August 15, 2003. Why a microbe from the oceans can survive high-temperature autoclaving. Health Sterilisation 'can spread CJD': BBC News, February 10, 1999. Researchers question whether simple autoclaving is sufficient to kill prions (proteins) that cause Creutzfeldt-Jakob disease. US Patent 20140219876: Autoclave for sterilizing instruments by Angelo Bellosi, Mocom S.R.L. A typical compact, modern autoclave for use by dentists. US Patent 4,127,384: Autoclave for sterilizing objects by Hans A. Fahlvik and Kurt E. Sandquist. An autoclave offering more precise control of temperature inside the sterilizing chamber. 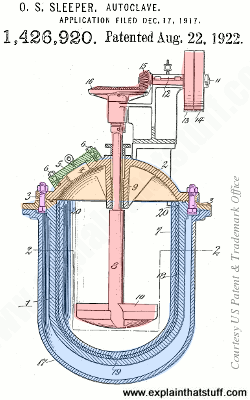 US Patent 1,337,146: Autoclave-tray for cooking glue by Louis Mauerhofer. An early industrial autoclave for preparing adhesives.